The essential things to be remembered in thermodynamics were given in the post dated 21st May 2008. (i) An isobaric process first and an isochoric (constant volume) process next. (ii) An isochoric process first and an isobaric process next. In both cases the gas expands and therefore work is done by the gas. You should remember that no work is done in the case of an isochoric process. So, no work is done in the processes indicated by PB and AQ (Fig.). 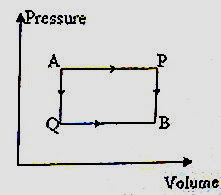 Work is done by the gas during the processes indicated by AP and QB. Since the work done is equal to the area under the PV curve, more work is done during the process AP. Therefore, W1> W2. (2) In the cyclic process on an ideal gas shown in the adjoining PV diagram, what is the net work done on the gas during the cycle? This is a simple question of the type often asked. You should note that in a cyclic process the gas is taken through a cycle of operations and brought back to the original state. If the cycle is clockwise as in the present case, work is done by the gas. So the work done on the gas is negative. Further, the area enclosed by the closed curve gives the work done during one cycle. = – 2P×2V = – 4PV. Since the process is adiabatic, no heat energy flows from the surroundings to the gas or from the gas to the surroundings. So, the entire work done in compressing the gas is utilised in increasing the internal energy of the gas. The work done on the gas is therefore equal in value to the increase in internal energy, which is 200 J. (4) The figure shows the variation of the pressure of a gas with temperature (and not volume) of a given mass of an ideal gas subjected to various processes starting from the state represented by point A. Which graph represents an isochoric process (a process in which volume is constant)? Some of you may be baffled on seing this simple question since most of you are accustomed to PV diagrams only. 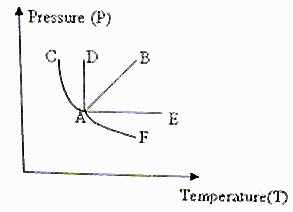 The required graph is AB [Option (a)] since the pressure of a given mass of gas is directly proportional to its absolute temperature when its volume is constant (in accordance with Charles law). 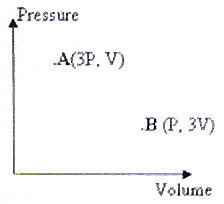 This type of pressure-volume relationship exists only in the case of the process shown by graph AB. 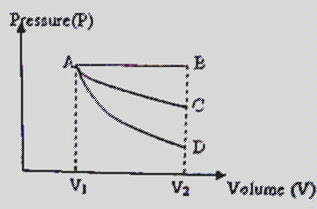 You can easily obtain the answer by referring to the PV diagram showing the three processes (Fig.). 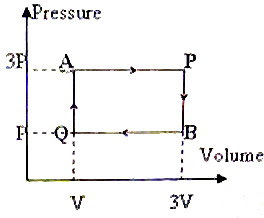 Since the area under the PV curve gives the work done, the maximum work is for the isobaric (constant pressure) process indicated by the cuve AB. So the correct option is (d).